Sentinel photo by Katy DiVirgilius Winners of the 2019 Miss Central Pennsylvania and Miss Central Pennsylvania Outstanding Teen scholarship competitions are, from left, Miss Central Pennsylvania’s Outstanding Teen Kari Ann Leventopoulos, Miss Greater Juniata Valley Jayden Moffa, Miss Midstate Marielle Roberts-McDonald, Miss Central Pennsylvania Sarah Pennington and Miss Midstate’s Outstanding Teen Hannah Fox. The pageant was held Saturday at the Mifflin County Middle School. 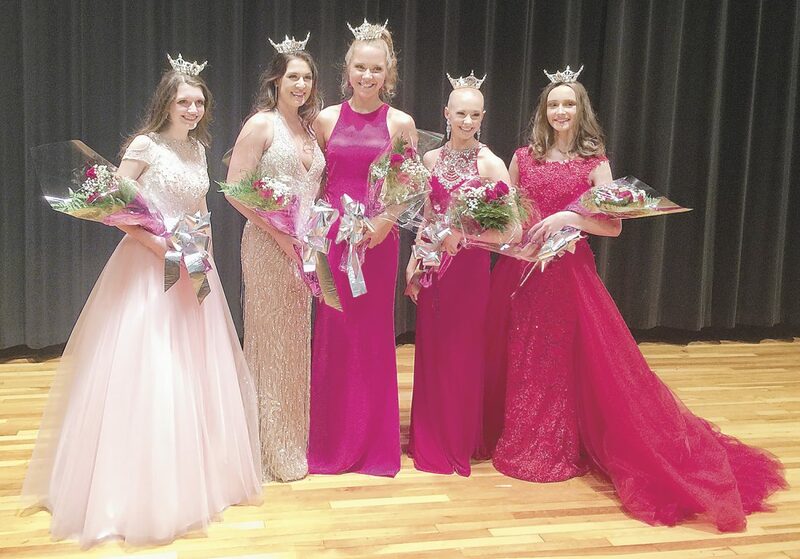 LEWISTOWN — Five Pennsylvania girls were crowed at the annual Miss Central Pennsylvania and Miss Central Pennsylvania’s Outstanding Teen scholarship competitions Saturday at Mifflin County Middle School. Following the national anthem sung by 2018 Miss Central Pennsylvania Alisa Vasquez, contestants performed a choreographed routine to open the competition. After a short group dance, each contestant identified herself, her place in school and her platform. Teens ages 12 through 17 competed for one of two “Outstanding Teen” titles, and young women ages 17 through 24 competed for one of three “Miss” titles. ¯ Miss Midstate’s Outstanding Teen – Hannah Fox. Emcees Chris Ruble and Miss Pennsylvania 2018 Katie Schreckengast moved the program along. The talent portion was worth 30 percent of the misses’ total score, and 35 percent of the teens’ total score. Judges examined interpretive ability, preparedness of skills and stage presence of each contestant’s performance. Teen contestants displayed their talents through vocals, tap dancing, a choreographed cheer routine and piano playing. Miss contestants used their skills in speed painting, color guard, a pom routine, tap dance, a comedy routine and vocals. Teen contestants participated in the lifestyle and fitness in active wear, which made up 15 percent of their total score. The girls had to display to the judges how they maintain physical and mental health by completing a routine of lunges, push-ups and mountain climbers. Miss contestants completed the lifestyle and fitness in swimwear, which accounted for 10 percent of their total score. They posed on stage in a swimsuit of their choice to show the judges how they maintain good physical and mental health. This is the last Miss Central Pa. pageant that will have a swimwear routine, since the Miss America organization has eliminated the swimwear portion of its competition. Teens had a combined category of evening wear and an on-stage question that comprised 25 percent of the total score. Each contestant was escorted onto the stage by a prince or princess. They posed in their floor-length gowns for the judges, then selected a question from a basket for Schreckengast to read. Some of the questions asked contestants to identify their greatest accomplishment, decide if social media is detrimental or beneficial to teens and explain how a teacher would describe them. Miss contestants had an evening wear category, which was 15 percent of their scores, in which they were each escorted onto the stage by a prince or princess, then walked and posed for the judges in their gown. Finally, the miss contestants had an on-stage question that was 20 percent of their score. These questions were all platform-based. Before the pageant, each contestant had an interview with the judges. 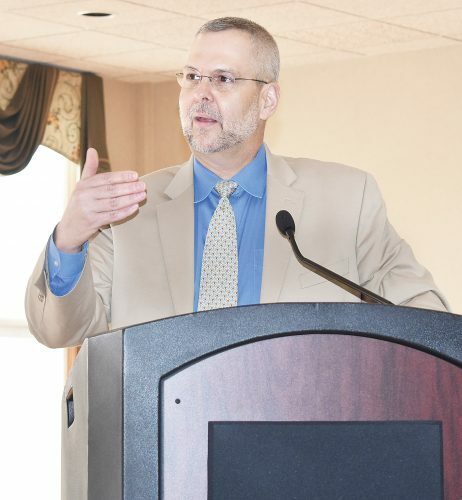 This private interview accounted for 25 percent of both the misses’ and the teens’ scores. Between each category, a 2018 title-holder would either perform her talent or give a farewell speech. The last performance was given by Ruble. For more information about the contestants and winners of the 2019 Miss Central Pennsylvania Scholarship Pageant, visit www.misscentralpa.org.